Morning all. A peaceful day in Ukarumpa today, but I will post on the prayer thread. I get clean teeth this morning. Good thing the dentist’s office sent a text yesterday afternoon. Mr. P bought the turkey 🦃 and left it in the underneath section of the 🛒. Luckily the guy was pulling them back into the store and took it in. The wrote down the weight so hours later when P asked me where the turkey 🦃 was and I didn’t know, a simple phone call and all I had to do was go pick it up and collect my six cents difference. I see Peter claimed 57 and everyone else left after that. Good morning for most. Today is the day for Art to drink that yucky formula that will keep him close to the comode. Miss Bosley was curious as to why we kept pouring bottles of water into the large container. It was a new thing for her to witness. We did not let her taste the results. Sometimes I think cats have nine lives because they have too much curiosity for only one. Art seemed happy to see the new tires and hubcaps that I got yesterday. That’s on a 2007 Corolla. We can’t seem to keep hubcaps on it. He has noticed other Corollas missing hubcaps. Has anyone else had a similar problem and found a solution other than buying new ones frequently? Poor Art. I would not tell him my last experience with that. I hope it is more like my first experience. Third time was not the charm, to say the least. Weird about the hubcaps. Are they being stolen or falling off? Hmmm . . . I did not think of them being stolen. That has not been an issue for this area in the past. We will have to keep our senses on alert. He had been driving the car without hubcaps for quite awhile, but with the new tires it made sense to put on new hubcaps. Kim, you may not know the answer to this, but can the cranberry stuff be frozen? I just spoke to Art and asked if he thought the hubcaps might have been stolen. He said he distinctly remembered seeing one fly off on the expressway. He thinks the clips don’t hold tightly enough on that model for whatever reason. I watched the Advance Auto Parts person snap them on and they looked plenty well attached to me. But maybe overtime they lose grip. 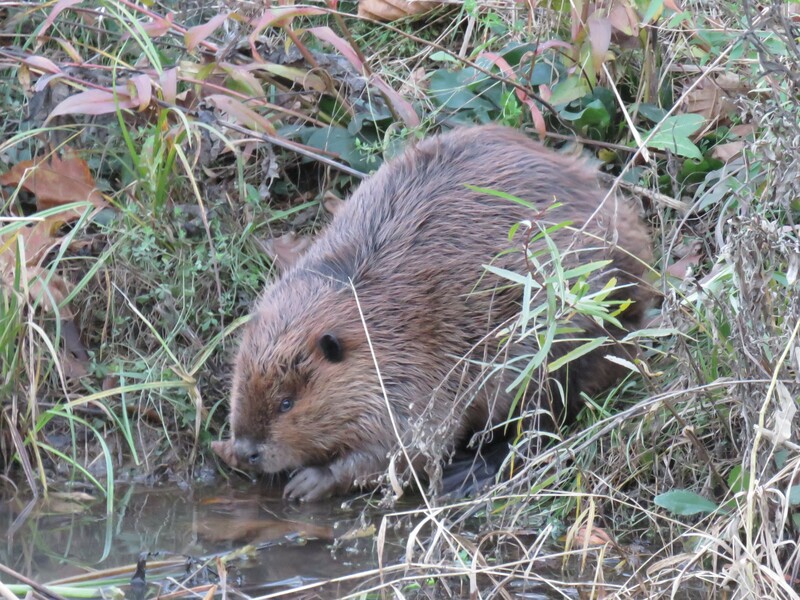 The beaver was almost as close to me as it looks–though I didn’t notice till seeing it in the header that is you look, you can see its webbed back foot and not just its hand. (I could see the webbed foot in an earlier shot in the sequence, but I hadn’t noticed it in this one.) It was getting dusk and almost too late for photos, so it helps that I barely had to touch the zoom. Previously I had never seen anything interesting in this particular little pond. Apparently any creatures within it get a good enough view of the humans walking by to have fair warning, since I have often heard a quick splash and figured I just missed seeing a muskrat or a turtle. One day I saw one single frog, and another day I saw two mallards, and that’s it on the wildlife sightings here. This particular day, I hadn’t seen anything worthy of note, nothing pretty like flowers, hardly any birds at all (one cardinal, but they’re a dime a dozen on this walk, and I didn’t see him till I was on my way home). I figured OK, I’d never yet had a “dud” when walking this particular area, but there’s always a first time, and oh well. I decided to swing up by the pond and then turn and go home. And the pond had this piece of brown fur lying by it. I wasn’t alongside it yet, and it was getting dusk, but I zoomed in to see if it was something living–it really looked like fur, but it didn’t look like it was moving, and surely if an animal that large had been up on the bank, it would have seen me before I saw it, and would have been long gone. But I zoomed in, and at the bottom of the brown lump of fur was a beaver tail. Quietly I moved up the trail, taking a couple of photos–I couldn’t see the head at all, as from my initial angle the head was hidden by a bush. And I wasn’t going to get good photos if I saw only a brown patch of fur with a tail, so I moved on, and eventually I could just see the head. But the fellow was definitely asleep and it didn’t wake up. It moved enough to say it was alive, but I even wondered if it was in a trap. (Later I remembered that beaver traps–at least the ones I’ve read about–are set up in the water.) Finally I decided to toss a rock into the pond below it, a natural enough sound that it shouldn’t panic it, but maybe it would open its eyes. It opened them, and then closed them again. Concerned that sleeping out in the open and not even waking up when a person was standing there maybe five yards away (but on the other side of the narrow pond from it) left it in potential danger as night fell, and also wanting a photo, I tossed another rock into the pond, and at that point I got this photo as it decided it was probably safer in the water. If your screen doesn’t show a lot of detail, his front hand /paw is just touching the water. The reality is that beavers are a formidable prey to just about anything that might encounter them (meaning they are larger than most of their potential predators and they know how to drown a dog), and he was really very near the water–but at the time I wasn’t thinking that, just thinking that an animal sleeping in the open, and barely opening its eyes and then closing them again, was quite exposed. I have heard twice at church of different people having seen a bobcat in their backyard, but as far as I know we don’t have cougars and we don’t have wolves, and coyotes can kill beavers but would probably have to find one farther from water and I’m not sure whether they can kill an adult. Probably half a dozen people jogged or walked by as I took photos of this rodent, and not one slowed down or noticed that I had something quite interesting in view. I wondered how long it had slept, and how many people had gone by in that time, and whether any of them had seen it! I always felt a bit of a connection to Joni, since she had her diving accident in 1967 (the year I was born) when she was 16, and I first read her autobiography when I myself was 16. I have never met her, but have heard her speak and have read several of her books. Learning from NancyJill, I went to a bakery and had hot chocolate with a friend yesterday. It was fun! I was sorry to see that last night (about Joni), too. I would not want that critter in my house. It is vaguely rat-like. Stolen hub caps is so West Side Story. Another day for me to work at home. I have 5 stories I’m trying to get done before the end of the day tomorrow — one of them requires a 2:30 p.m. in-person interview and tour of the under-construction Elks Lodge that was burned down 3 years ago by a disgruntled member. Since that’s close to home I am just staying here again today to work. The thermostat works wonderfully. Mayor Garcetti missed his chance to win a vote, but oh well, that’s life in the big city when you’re also running for president, I suppose. Janice, yes, cats are crazy curious, it cracks me up just watching Annie’s wheels turning as she explores something unfamiliar — or even something familiar (a cupboard or cabinet, usually) but seen (by her) in a new light all over again and in urgent need of renewed exploration. She almost started following us on the dog walk last night so I had to get her back into the house. I hadn’t realized she’d made her way out onto the front porch when I was heading out down the driveway with the dogs. Sure enough, as soon as we hit the sidewalk, she bounded right down the steps, ready to go along. My outdoor cats have managed to train the old dog new tricks. The two indoor dogs now understand that chasing cats is not something they want to do. Why do people steal hubcaps? What do they do with them? Yes. My Corolla used to lose them regularly. I also have a neighbor with one that has the same issue. I like that solution, AJ, but am not sure it would work on the major expressways we travel daily. I am imagining the hub cap loose and rattling along and causing a twenty car pileup. It happens in Atlanta where anything can happen. Our hubcaps fell off last time son changed the tires. We found them out on the road just past our driveway. The little clips had broken. I have had several cars since 1952. I have never lost a hubcap. I have clean teeth and a Christmas present bought. Since I was in town anyway I went to the toy store. My own Baby Girl and First Grandaughter both got Little Huggums Baby Dolls for their first Christmas. Miss Maddie will be receiving hers as well. I think I may have my own Little Huggums in the attic. I know I have two Pussycat Baby Dolls. One in blue with dark hair and one in pink with blond hair. I was not allowed to play with the Blue Baby, so I allowed my niece to play with the Pink Baby. BG also had another baby doll made by some famous doll maker. Her name is Olivia. She lives in the toy box in the closet. She is almost like holding a real baby. Ugh. Nightingale has bought one of those Elf-on-a-Shelf elves to do that with The Boy this year. She has come up with a story to explain why Santa hadn’t sent an elf in previous years. Those things are so creepy! The elf that Nightingale bought is in the Victorian style. Still looks creepy. Do we need to have hub caps? The car drives without them, right? Not necessary. Just slows the thieves down when they want your tires. Rather than argue on the political thread, let’s watch these. I’ve told you about the Bible project before, right? Yep, the first was good, I shall carry on with my cohort. I have considered not having hub caps in the sense of practicality, and I am fine with that. But others who are known by the company they keep (or work with) are not fine with that and ask Art about when he will replace the hub caps. Now the person I am referring to is more into cars than we are and is out for medical reasons. She and her husband bought Hank Aaron’s used car so I guess that might tell you a bit about what they expect cars to be like. In top notch shape. They don’t have that car but have other snazzy vehicles. The person I mentioned enjoys driving and Art and I have enjoyed her generous spirit in driving us around in much nicer cars than we’ve ever owned. I suspect they can also protect the lug nuts so they don’t get all rusted up unless they are the fancy open ones, then I suspect it is mostly just looks. Like crown molding. The regimen has begun. Art is in the bathroom and my job is to bring him more yucky drink every fifteen minutes. I would have a woe is us pity party, but I don’t have time for the celebration. I went to T-Mobile earlier and got some rearranging done on my phone to free up space. I did not realize it is T-Mobile Tuesday when they give a free gift. The gift today was a really cute toboggan. The funny thing is that when I did my haiku today one line was about my new toboggan (I wrote it before going to T-Mobile). God is sweet to time things when we need a little cheer. We no longer have hubcaps, but fancy rims for our summer tires. We had cattle guards (Texas gates) where we used to live and they always rattled off a hubcap or two, so we just gave up finding and replacing them. Up here in winter, most people have plain steel rims for their winter tires, so it’s practical and ‘ugly’ but no hubcaps. as I handed him another cup full. I hope the cup has supernatural powers with the suggestions. I am sorry to share my Black Tuesday humor. Well, painters were back for final touch ups but they couldn’t finish so they’ll be back AGAIN on Friday. Sheesh. At least they’re thorough. Meanwhile, I need to leave on an interview that’ll take probably 90 minutes and I have to leave the front door open so some touch-up paint will dry. I think I’ll stick the dogs in the back, the guys barricaded the passage to the door from the living room but I don’t trust my dogs to figure out a way through. Hate just leaving the door open like that but people will assume that SURELY someone is home, right? My parents had a Toyota Corolla back in the days when I was learning to drive. I don’t remember any problem with hubcaps coming off. Did they make them better in those days? Were there fewer hubcap-stealing people around there at that time? I don’t know. Kare, what fun to read of your kitchen arriving last weekend! So excited for you! And DJ, the paint job getting done! Well, almost, with the finishing touches coming up Friday. Wow. It sure sounds pretty — brandywine; I would love a color like that. Now the sleeping beaver is up. I had to get to the right of the critter to be able to see its eyes and its nose. But really, do you expect to see a wild animal dozing out in the open like that, with a person just yards away snapping photos? The stream was between me and it, and a bit of a hill behind it, so it was not as “open” as it might have been, but it really was not under cover at all. I assume it hadn’t yet built a lodge and had to sleep somewhere. And perhaps beavers sleep sounder than other creatures since they do usually have the safety of a lodge? Do notice the tail–positive identification of this fellow and its truly unique feature. A couple days later my husband went on a walk with me. We went past this spot and I pointed out the slick, muddy area where the beaver had been sleeping. As we were walking back home, my husband said of course the beaver wouldn’t show itself–it would be too afraid of being turned into a hat. It was then I realized he was wearing the fedora made of a beaver pelt. (Imported from Australia.) The poor beaver probably thought me a traitor, going and bringing someone who would wear such a thing! I think the difference between older cars and new ones is that the hubcaps of old only covered the middle part of the rim, protecting the hub, in which were the ball bearings and lots of grease. Now cars have wheel covers, which cover the entire rim and are held on by plastic clips instead of metal to metal contact. They are nearly impossible to put on correctly unless you know what you are doing. And if they aren’t totally secure will come off if you hit a big bump. And the reason people steal them is because they are worth a lot on the second hand market. they are easy to sell used for $25-$50 each, which is much cheaper than new ones for some cars. I got a delivery of pet food today and as soon as I took the items out of the large cardboard box, Annie jumped in it. All I saw later was her little face peering out of the top, she is so clever. What is it about cats and boxes? It’s so funny. AJ- The Pigskin Picks are in your in box. I sent them early because one of the games is Thursday night. Looking out my dining room window, I can see a dead deer hanging from its hind legs from a tree in my neighbor’s yard, right over the property line. We may set a record for the coldest Thanksgiving on record here. The high is only supposed to be 19*F.
The book Divine Design by John MacArthur is free for Kindle on Amazon. I’d hoped they would feel embarrassed. Instead, several parents thanked me for bringing them in pajamas to make the point. They always got dressed after that. I see on FoxNews that some colleges (I think in England) have forbidden teachers to write in ALL CAPS. IT MIGHT FRUSTRATE THE STUDETS. I fear for the students. College is supposed to prepare students to face the real world. This protection form any sort of emotional challenge is going to leave a lot of people unprepared to live in the real world. oh, did someone say 49? Wow, I’m jamming out the stories this week, trying to build up a reserve for editors for the long weekend. I’ve written three so far (and part of a fourth). I need to finish that fourth tomorrow and write another story and then that’ll be all I can manage, I think. Churn, churn, churn. Today a photographer and I got the walking tour of the Elks Lodge that was burned down by an arsonist nearly 5 years ago. It’s been a nightmare to rebuild, especially with all the city hurdles and hoops to jump through — adding bio-swales to the property was just the beginning. LA regulations and codes are very dense and demanding. The building isn’t done yet, but a lot of the major work is finished and, if they get their master electrical plan permit next week, they’re looking at a possible March/April re-opening. The Elks bought the property in the 1960s on a hilltop overlooking the harbor — it’s truly a spectacular location and they got it (compared to today’s prices) for a pittance. They built the new building the same as the old except they took out all “walls” blocking the views and it’s all glass for a panoramic view that takes in the Hollywood sign to the OC coastline on a clear day. That story is partly written, have to finish it tomorrow. Computer secret for those who type a long post and accidentally erase it: command ‘z’ will bring it all back. 🙂 I know I’ve used it at work but I tried it for the first time on my home mac and it works here, too. Computer secret for those who type a long post and accidentally erase it: command ‘z’ will bring it all back. That’s CTRL + Z for those of us with real computers. DJ, I found out that secret a few years ago, and wished I had known it earlier. It’s quite useful!